Today, we release our Families First General Election Voter Guide (PDF) for state and federal elected offices. Please download your copy from this Web page (or download the PDF directly) and help us spread the word via e-mail, Facebook, Twitter and even by hand. On Wednesday of this week, we're teaming up with the RLCNH for an informational meeting on General Election Ballot Questions 1 & 2. Don't miss the opportunity to learn about why these two constitutional amendments are needed starting at 6 p.m. at Thomas More College in Merrimack. We have some great photos from Saturday's Stand Up for Religious Freedom Rally, which attracted about 210 people to oppose President Obama’s HHS Mandate and other attacks on our religious liberty. You can view those photos below, along with my prepared remarks and Speaker O'Brien's remarks. 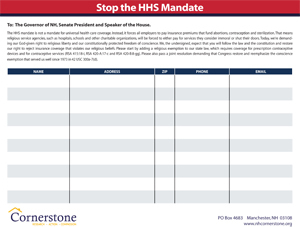 We released a petition on Saturday at the Stand Up For Religious Freedom Rally that asks our State Legislature to create a religious exemption to contraceptive mandates in state law and to send a message to Congress to stop the HHS Mandate. Please download the petition and mail it back to us at P.O. Box 4683, Manchester, N.H. 03108 so we don't leave your name out when we submit it to the Legislature. Cornerstone Action PAC is adding two additional Candidate Corner features to make sure we include all the candidates who have pledged to put families first. Look for Cornerstone Action PAC's last four Candidate Corner e-mails for this election cycle on Wednesday and Friday of this week and next week in your inbox. If you like what you've been seeing from Cornerstone this election cycle, please donate to Cornerstone Action today and show your appreciation! 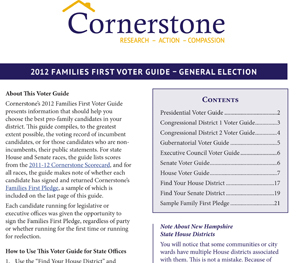 In a soft launch for our friends on this list today, Cornerstone Action is releasing its Families First General Election Voter Guide (PDF) for state and federal elected offices. Please download your copy right now from this Web link page (PDF download link) and help us spread the word via e-mail, Facebook, Twitter and even by hand. With two constitutional amendments, 400 members in the House, 24 senators, five executive councilors, a governor and two Congressmen to vote for on New Hampshire ballots this Nov. 6, it can sometimes be very difficult to track down all the conservatives who will always put traditional family values first upon their election. With Cornerstone's voter guide (PDF), we have identified the candidates—both Republican and Democrat—whom have signed our Families First Pledge, and we are also identifying how closely legislative incumbents voted with the principles outlined by our Families First Pledge during the last session. Cornerstone expects pledge signers will always support bills or initiatives that advance citizens’ rights of conscience and religion, protect innocent human life, defend the natural family and traditional marriage, restore the natural rights of parents to raise, educate and care for their own children, and enact free market economic policies to ensure prosperity in New Hampshire. Today's state voter guide (PDF) will help you sort this all out for the candidates running in your voting district so you know whom you're voting for and can feel comfortable walking out of that voting booth on Nov. 6. For the governor's race, the Congressional races and the presidential race, Cornerstone has created special voter guide pages that are included on the same voter guide (PDF). We have identified whether these candidates have signed Cornerstone's Families First Pledge, but we have also tried to identify how these candidates stand on several important issues to New Hampshire families. 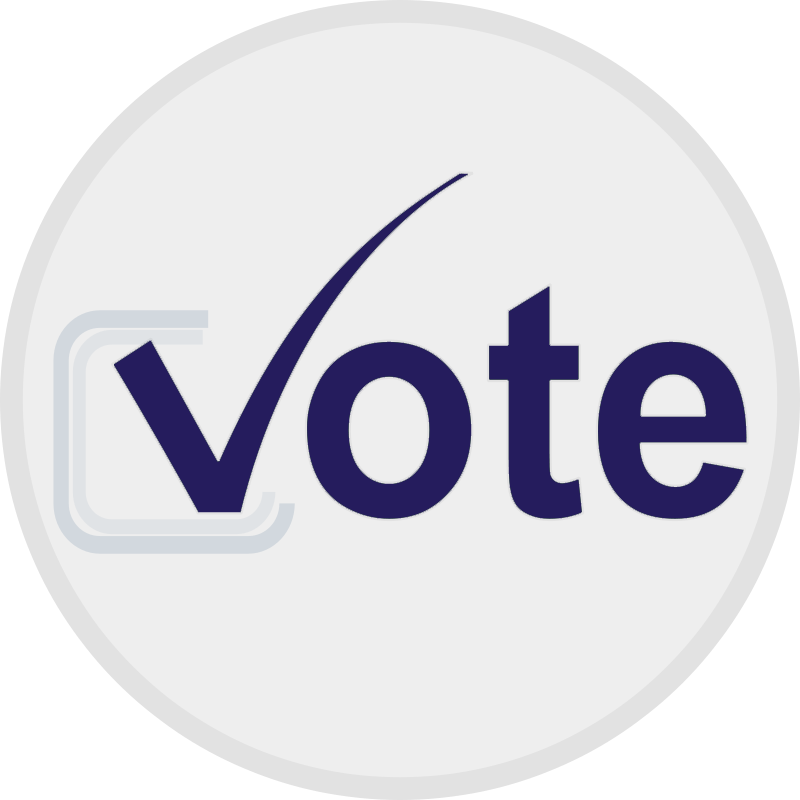 Please download Cornerstone's voter guide (PDF) to make sure you are fully informed on Election Day. Cornerstone is teaming up with the RLCNH for an information session this Wednesday on the constitutional amendment questions that will appear on the Nov. 6 ballot. State Reps. Paul Mirski, Paul Ingbretson, Dan Itse and Gregory Sorg will present information on the two constitutional questions, and then a question and answer period will follow. Rep. Mirski is the prime sponsor of both amendments, and the three other representatives are well versed in the rationale behind these changes. All four of them will be a great resource for anyone who doesn't understand why these changes are necessary. The event will take place starting at 6 p.m. on Wednesday, Oct. 24, at Thomas More College of Liberal Arts, 6 Manchester Street, Merrimack, N.H. "[Art.] 5-c. [Income Tax Prohibited.] Notwithstanding any general or special provision of this constitution, the general court shall not have the power or authority to impose and levy any assessment, rate, or tax upon income earned by any natural person; however, nothing in this Article shall be construed to prohibit any tax in effect on January 1, 2012, or adjustment to the rate of such a tax." [Art.] 73-a. [Supreme Court, Administration.] The chief justice of the supreme court shall be the administrative head of all the courts. [He] The chief justice shall, with the concurrence of a majority of the supreme court justices, make rules governing the administration of all courts in the state and the practice and procedure to be followed in all such courts. The rules so promulgated shall have the force and effect of law. The legislature shall have a concurrent power to regulate the same matters by statute. In the event of a conflict between a statute and a court rule, the statute, if not otherwise contrary to this constitution, shall prevail over the rule. If you have questions about these two constitutional amendments, please attend Wednesday's event. We have some great photos from Saturday's Stand Up for Religious Freedom Rally (see the slideshow to the right). The event attracted about 210 people, who came to oppose President Obama’s abortifacient birth control mandate and other attacks on our religious liberty. More importantly, these great New Hampshire citizens came out to peacefully assemble, pray, sing and stand up for their constitutionally protected inalienable rights. After all, the First Amendment to our U.S. Constitution says that "Congress shall make no law respecting an establishment of religion, or prohibiting the free exercise thereof." Part 1, Article 4 to the N.H. Constitution says, "Among the natural rights, some are, in their very nature unalienable, because no equivalent can be given or received for them. Of this kind are the Rights of Conscience." And Part 1, Article 5 to the N.H. Constitution says: "Every individual has a natural and unalienable right to worship God according to the dictates of his own conscience, and reason; and no subject shall be hurt, molested, or restrained, in his peers on, liberty, or estate, for worshipping God in the manner and season most agreeable to the dictates of his own conscience; or for his religious profession, sentiments, or persuasion; provided he doth not disturb the public peace or disturb others in their religious worship." If you missed Saturday's event, please take the time to read my prepared remarks, Speaker O'Brien's prepared remarks or view video excerpts of Saturday's speeches by visiting the Amherst Patch. State. Rep. candidate Jane Cormier has her speech on YouTube. The Concord Monitor had a great write-up of the event as well! On top of attracting a large, motivated crowd on Saturday for the Stand Up For Religious Freedom Rally, Cornerstone released a petition that asks our State Legislature to create a religious exemption to contraceptive mandates in state law and to send a message to Congress to stop the HHS Mandate. "The HHS mandate is not a mandate for universal health care coverage. Instead, it forces all employers to pay insurance premiums that fund abortions, contraception and sterilization. That means religious service agencies, such as hospitals, schools and other charitable organizations, will be forced to either pay for services they consider immoral or shut their doors. Today, we’re demanding our God-given right to religious liberty and our constitutionally protected freedom of conscience. We, the undersigned, expect that you will follow the law and the constitution and restore our right to reject insurance coverage that violates our religious beliefs. Please start by adding a religious exemption to our state law, which requires coverage for prescription contraceptive devices and for contraceptive services (RSA 415:18-i, RSA 420-A:17-c and RSA 420-B:8-gg). Please also pass a joint resolution demanding that Congress restore and reemphasize the conscience exemption that served us well since 1973 in 42 USC 300a-7(d)." Please download the petition and mail it back to us at P.O. Box 4683, Manchester, N.H. 03108 so we don't leave your name out when we submit it to the governor and the Legislature after they are sworn into office in December. Could you help us continue our efforts? If you can manage, please donate to Cornerstone Action today so that we can keep you up to date about the issues that matter most to N.H. families. Copyright © 2012 Cornerstone Action, All rights reserved.